Empowerment and Gender Equality in Water and Sanitation: What does it mean? What does it matter? If you know of work done by non-profit or governmental organizations globally, you have likely heard the words – empowerment and gender equality. Groups worldwide use these terms in apparent pursuit of more equitable water and sanitation projects ranging from entrepreneurship to provision. 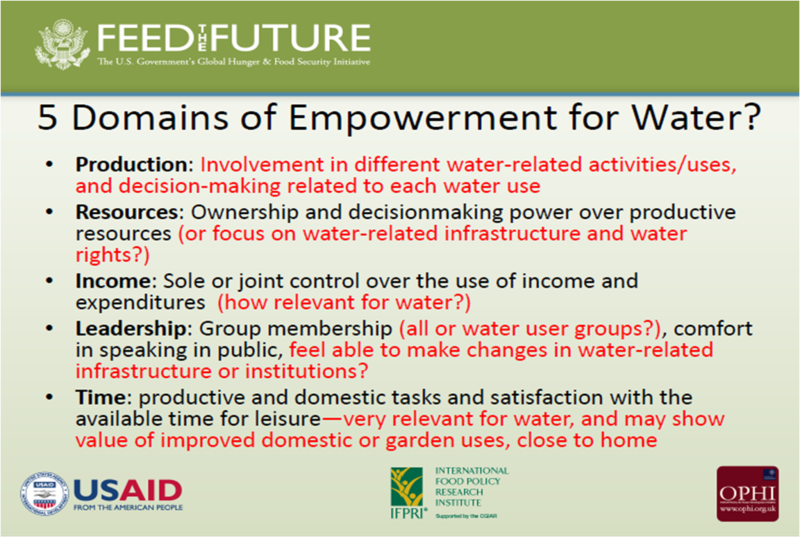 When first exposed to these terms during my master’s studies in 2010, I became intrigued with understanding how empowerment and gender equality related to more participatory water and sanitation projects. Yet after conducting research for my master’s project [Empowerment and Gender Equality for Water and Sanitation in Rural India: Two Case Studies], it became clear these terms were used by organizations very differently. While some organizations might imply a borewell for water results in empowerment, others said participating on a decision-making committee results in empowerment (and so on). Amidst this array of disparate definitions, it appeared to me such terms still might have some capacity to be somewhat useful conceptual approaches for more equitable water and sanitation projects. So when I received the opportunity this past summer to attend two different workshops focusing on empowerment and gender equality, I took the chance. 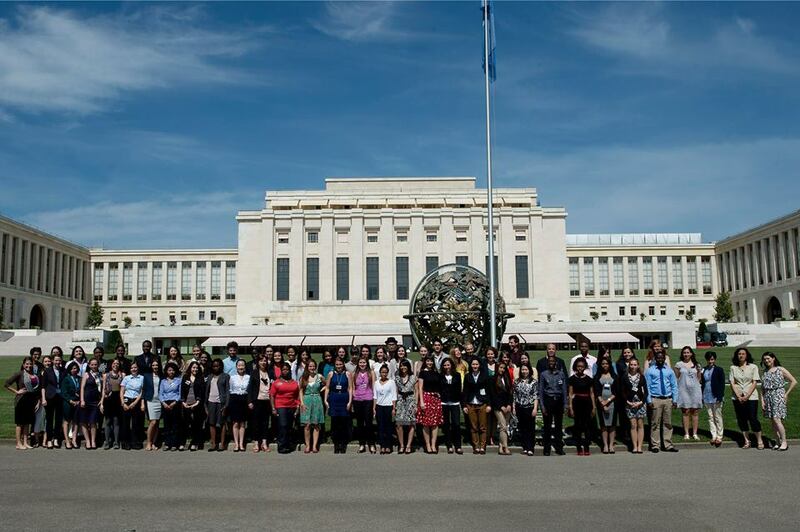 In July, I attended a United Nations program in Geneva to see how different UN entities employed (or failed to) these concepts. In August, I traveled to UCLA for another workshop focusing on empowerment in public health. After attending the UN Graduate Study Program, I began to wonder if there might be better discourse for equitable water and sanitation projects globally. Study program participants heard over twenty seminars from UN agencies – International Labor Organization, International Organization for Migration, Inter-Parliamentary Union, UN High Commission for Refugees, UN Human Rights Council, Office for Coordination of Humanitarian Affairs, UN Office at Geneva, UN Secretary General Envoy on Youth, UNAIDS, UNCTAD, UNDP, UNEP, UNFPA, and UNICEF. Many of these organizations talked about how they focus on women internally and externally, but it was often difficult for them to describe how they incorporated a true gendered-approach into their practices (e.g. focusing on power differentials between all people not just looking only at women). It appeared some of them were stuck in a paradigm of second-wave feminism when more transnational feminist approaches are now critical. What this means in basic terms is that most UN agencies use a “universal woman” approach (i.e. a “western woman” approach) instead of looking at larger nation-state and economic structural disparities. Above Photo: Author of blog post is located in left front row in white short-sleeve button-down. UN Photographer. The long-term goal of this proposal is to improve measurable public health outcomes linked to WASH among unhoused people (men, women, and children) living in group camps furthering their upward social mobility and capacity to participate in social change. The objective of this proposal is to pilot low-cost and scalable WASH solutions coupled with participatory WASH programs in two group camps in two US cities. This pilot program is gender-sensitive using gender-specific solutions (e.g. eco-urinals and a menstrual hygiene management program) and gender-sensitive participatory techniques (e.g. community dialogue about gender burdens of WASH and representative participation). This pilot program uses an arts-based approach to give unhoused people a venue to highlight vulnerability in water and sanitation while communicating with policymakers to influence greater social change. This pilot program will lead to engagement in both individual and collective processes of empowerment resulting in critical consciousness among unhoused people in the realm of WASH. So the jury is still out on water and sanitation development sector usage of terms like empowerment and gender equality. It is not that empowerment and gender equality approaches are incompatible with true participatory water and sanitation programs. It is just that: 1) empowerment water and sanitation projects should be bottom-up instead of the top-down, 2) empowerment and gender equality definitions should be clearly outlined prior to development of water and sanitation programs, 3) larger structural frameworks and power structures have to be taken into account (e.g. examining how someone can experience empowerment on a local scale while being disempowered on the global economic scale), 4) it is critical to consider scale when thinking about empowerment and gender equality in water and sanitation, 5) empowerment as part of international-development discourse might actually reinforce oppressions, and 6) alternative conceptual approaches for examining and participating in equitable water and sanitation programs could include liberatory or autonomous frameworks. Author’s Postscript: If you would like to read more about empowerment theories from multiple disciplines, please check out this shared Google Drive list put together by colleagues and myself.